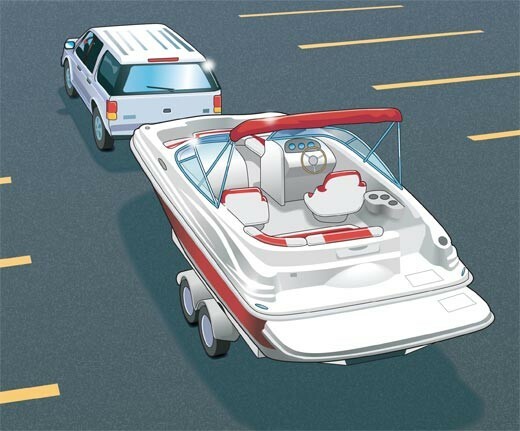 Ensure the boat is fully secure on the trailer. 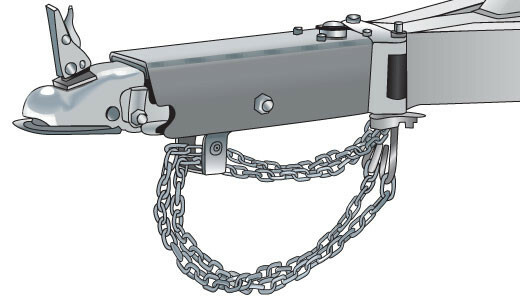 Use tie-down straps on the D-rings on the transom to hold the rear of the boat to the trailer. 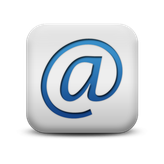 Connect the D-ring on the bow to hold the front of the boat in position. On arrival, park well away from the slip. Remove the tailboard straps and boat cover. Insert the bung and check the hull for damage in transit. 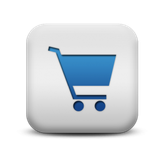 Load the boat with equipment and supplies. After a long journey let the wheel bearings cool for 45 minutes before launching. Immersing hot wheel bearings earlier may create a vacuum as the bearings rapidly cool, this draws in water and washes out the grease from the bearings. How far the trailer is reversed into the water depends on the gradient of the slipway, the size and weight of boat, and how easy it is to launch from the trailer. The rear of the boat needs to float so that it can be reversed or pushed off the trailer. Car wheels are best kept well away from sea water. Manoeuvre the trailer to the top of the slipway. Reverse down the slipway if possible only partially submerging the trailer’s wheels (to preserve the bearings and brakes) then push the boat off the trailer or hop into the boat and reverse it away. 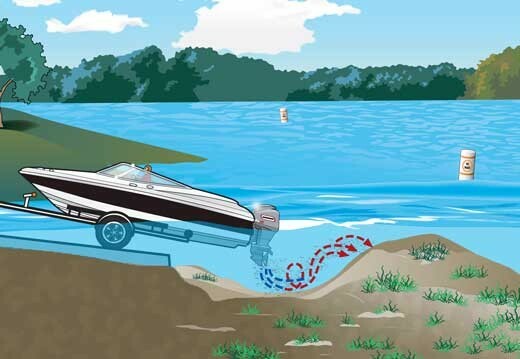 If the gradient of the slipway is shallow which prevents you launching with the trailer attached to the car, use a rope or metal extension bar to enable the trailer to be reversed further into the water (see photograph above). At the top of the slipway, disconnect the trailer, lower the jockey wheel and put the handbrake on. 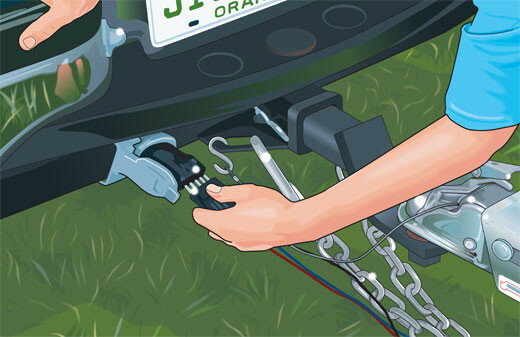 Connect a long line between the trailer and the tow hook using bowlines. Drive the car forwards to take up the slack in the line. Remove the handbrake and slowly reverse down the slipway while an assistant keeps the trailer in line. The assistant may need to enter the water to ease the boat off. 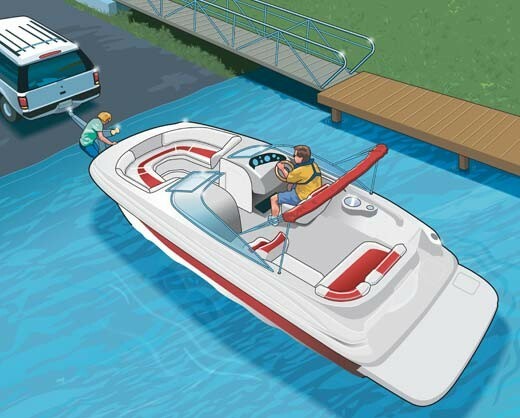 Tip - Launching with a rope between the vehicle and trailer can be useful to keep the tow vehicle’s wheels clear of the lower slippery part of the slipway and water. 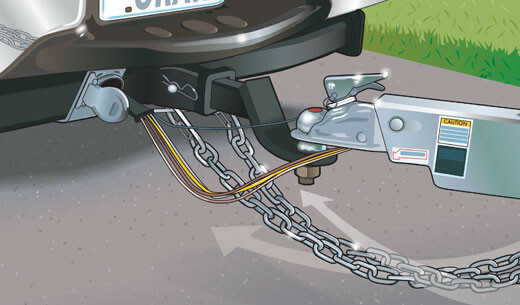 To avoid the boat sliding off the trailer when backing down the slipway; ensure the winch strap remains attached to the boat along with an additional safety chain or line between the boat and trailer.